“In the hands of any lesser an arranger, this piece would have died an early death - but here and in Moran's hands the music soars with the beauty of a rainbow (regarding Brian's arrangement of The Partisan). “Most memorable for me is the wonderful guitar solo by Moran on Solid Brass Numchuk (from Blowout's The Supporting Theory). Equally at home in both jazz and latin guitar styles, Brian Moran is one of the Bay Area's more versatile and accomplished musicians. Since graduating from Berklee College of Music in 1998, Brian has made the San Francisco Bay Area his home, where he maintains an active performance and teaching schedule. Brian began his study of the guitar in 1987, beginning with rock guitar, and later focused exclusively on jazz for 10 years, in which time he led the Blowout Sextet, composing and performing original music and releasing the CD "The Supporting Theory" to rave reviews. 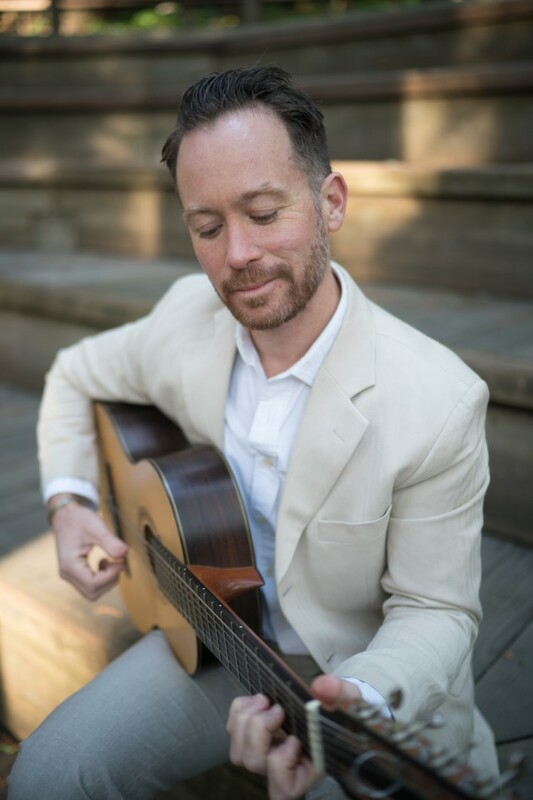 Since 2001, Brian has dedicated much of his time to the study of 7 string jazz guitar, Spanish and Brazilian guitar, Brazilian cavaquinho and bandolim; and includes classical, Brazilian music, and flamenco in his diverse repertoire. He was nominated as a "Latin Jazz Guitarist of the Year" in 2011 by Latin Jazz Corner. He is a founding member of the Bay Area's "Grupo Falso Baiano", a project dedicated to Brazilian choro and samba music. Brian's instructional articles have been published in Acoustic Guitar Magazine (Dec 08, July 09, Nov 10). Notable work includes performances with Brazilian guitarists Romero Lubambo, Alessando Penezzi, Rogerio Souza and Ricardo Peixoto, jazz guitarists Howard Alden, Bruce Forman and Mundell Lowe, and many others such as Jovino Santos Neto, Harvey Wainapel, Jorge Alabe, Ted Falcon, and actor/improviser Timothy "Speed" Levitch ( Waking Life , The Cruise ). He has lent his talents as a recording artist to many projects, produced music for the openings of photographers Annie Liebowitz, Ruth Bernhard, painter Robert Bechtle, performed at the San Francisco, San Jose, and Healdburg Jazz Festivals, SFJAZZ, SFMOMA, LACMA, appeared on television and in theatre, and has composed and conducted for numerous other projects including The Alamo, and The Dallas Museum of Art. Bruce Forman calls him a "thorough musician who has spent a great deal of time assimilating the wealth of Jazz history and has found a wonderfully personal way of expressing himself". He currently plays with Grupo Falso Baiano, Jorge Alabe and Grupo Samba Rio, Xaxado Mission Forró band, and as a leader and sideman in various other jazz, blues, and world music groups. UCSF Anchor Study jingle: (2014). Composer/Arranger/Performer. Grupo Falso Baiano: Simplicidade: Live at Yoshi's (2011). Grupo Falso Baiano: Viajando: Choro e Jazz (2008). Grupo Falso Baiano: Live at The Hillside Club (2006). Xavier Viramontes:Printmaker(documentary film), by filmmaker Michael Fraser (2006). Blowout: The Supporting Theory, Lifeforce Jazz Records (2004). Brian Carmody Quartet, featuring vocalist Allegra Bandy (2003). Performer. Released and liscenced to Seismicom.com.